I’m so excited to share with you guys our latest DIY project. 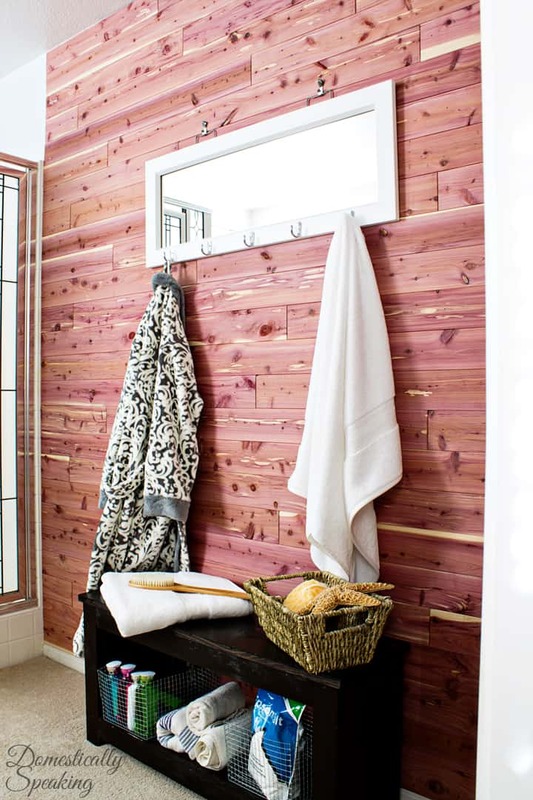 We recently added cedar planks to a wall in our master bathroom and I love the rustic glam it’s added to our space. Every time I walk into the room I feel like I’m in a spa sauna or a rustic lodge. It has created this calming, relaxing feeling in our bathroom. 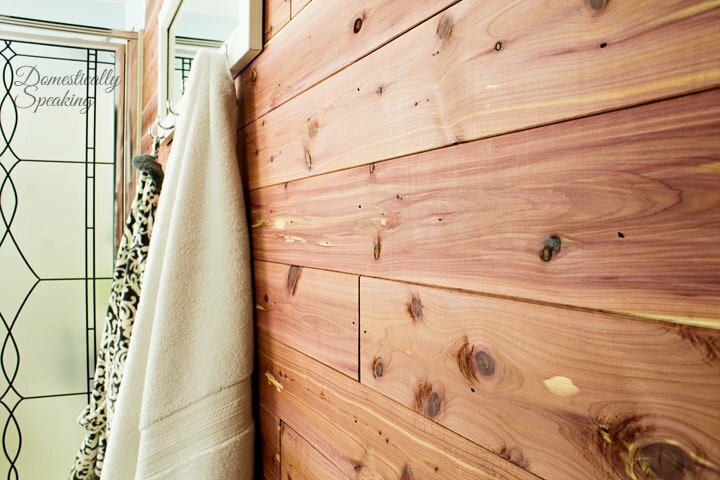 We used CedarSafe Natural Closet Liners for our plank wall. We marked the studs by drawing a line from the floor to ceiling. They were so easy to install with the grooved edges. 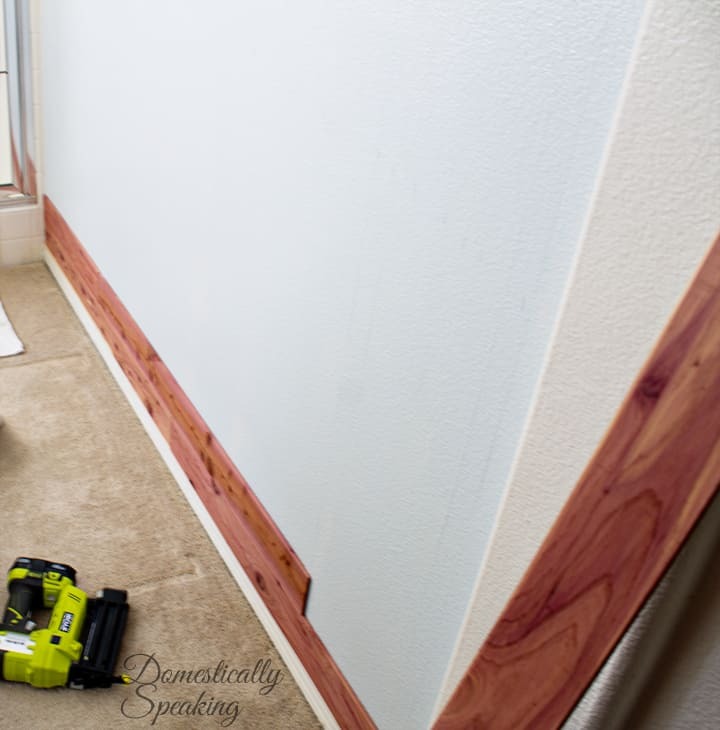 We used a nailer for easily installation. There is such beautiful variations of colors in the cedar. And it smells wonderful! It has changed the whole feel of the room and it only took about 1/2 day with breaks. 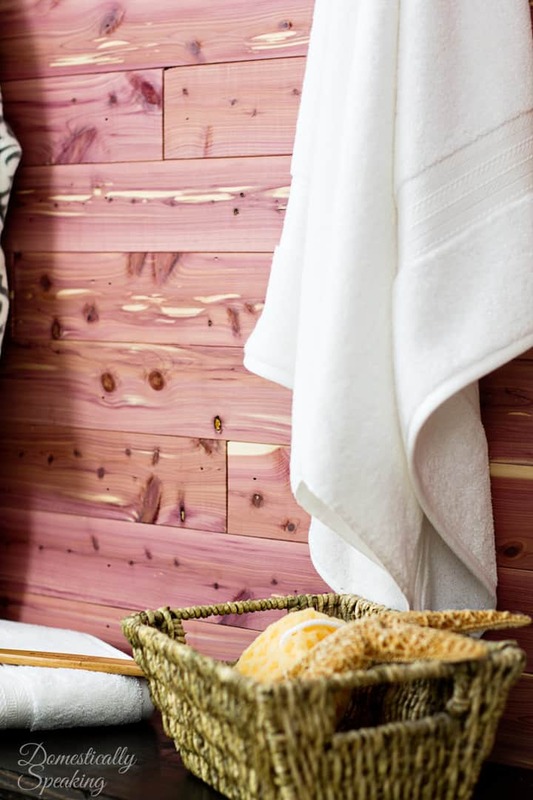 It’s a beautiful, rustic addition to a room. It’s going to pair perfectly with the glam that I’ll be installing on the other wall. 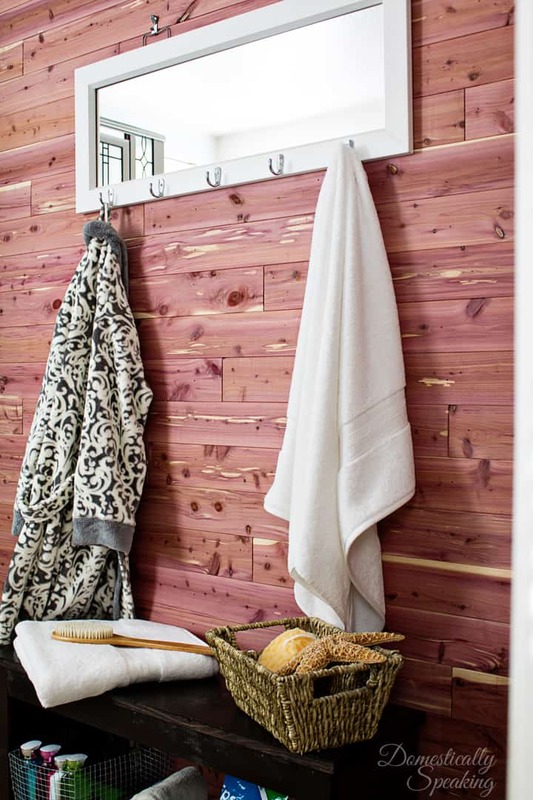 Thanks for stopping by… I’m hoping to have some more of the bathroom makeover to share with you next week. Thank you to Cedar Safe for sponsoring this post and for supplying me with cedar planks for this project, as alway, all opinions are my own. Fantastic makeover! I love cedar as well. Are the planks treated or did you have to seal them? Looks beautiful! I love the look and smell of cedar. What a great idea. Wow! Gives it a spa look. I bet it smells wonderful!! This is really beautiful! I bet it smells fantastic, too! So my grandparents home smelled like mothballs growing up. This is SO MUCH BETTER of a solution! I love the smell of cedar! this turned out amazing, can’t wait to see the rest! 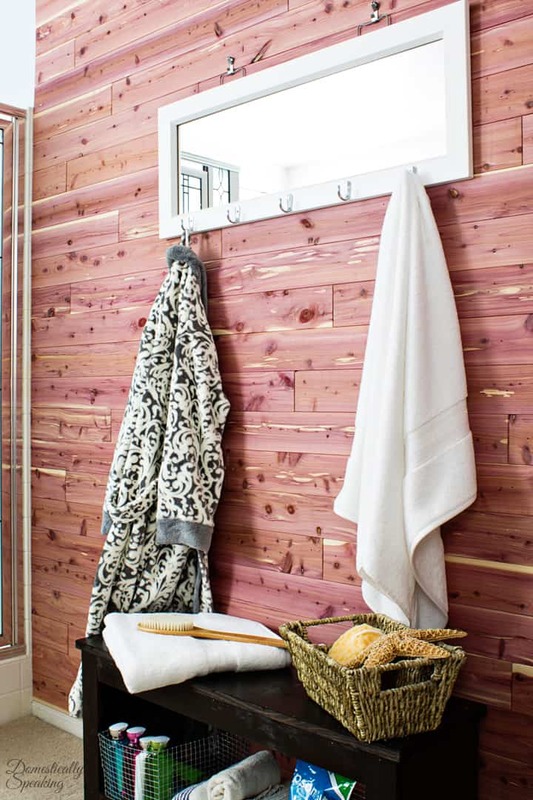 Not sure we’d go for cedar planks in bathroom but the idea of even one wall with planks sure appeals to me. I would paint them white to keep room nice and light, just have to decide which wall/walls to apply planks, then there’s convincing hubs it would be good idea. Would be extra insulation at least on walls. Would like some planks on bedroom walls also.